The Model 2030 Series Digital, Mechanical Flowmeter is a compact, general purpose instrument for flow measurements in rivers, estuaries, canals, sewage outfalls, and offshore applications. It is ideal for determining water speed, volume, or distance. • Will work with plankton nets. • Does not block sample! An accurate, convenient way to measure flow in streams, rivers or with plankton nets. Balanced to maintain a horizontal position when suspended from a tow line. This simple, reliable instrument features a nickel-plated brass nose cone, clear polycarbonate body and precision moulded rotor connected to a six digit counter which displays each revolution on an odometer. Unlimited depth capacity. Includes: 8-3/8” long flow meter, 18” stainless steel tow line and stainless steel connecting axle pin. Optional telescoping aluminum rod extends to 8’ to measure currents from river banks and bridges for stream sampling. The Flowmeter incorporates a precision muolded rotor coupled directly to a six digit counter which registers each revolution of the rotor and displays it in a fashion similar to that of an odometer. 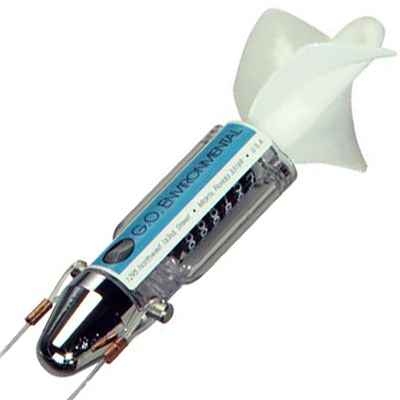 The counter is located within the body of the instrument and is displayed through the clear plastic housing. Weight in Air: 225 grams (8 ounces). Materials: Celcon rotor. Nickel-plated brass nose cone. Polycarbonate body. Armaloyed stainless steel main rotor and idler gear shafts. Dimensions: 21.3 cm (8 3/8") overall length. Standard rotor diameter: 6.98 cm (2 3/4"). Low-speed rotor diameter: 16.5 cm (6 1/2"). Depth Rating: Unlimited (free flooding). Data Readout: Six 10-digit counter wheels reading 000000 to 999999. Ten counts per rotor revolution, non-resetting. Read data by noting difference in beginning and end readings. (counter advances through 000000). 6-Digit Full Scale Counter: 999999 counts equals approximately 14.5 nautical miles. 7-Digit Full-Scale Counter (Model 20307): 9999999 equals 145 nautical miles. Mounting: Universal bridle allowing single-point connection for towing or two-point connection within net mouth. Response with Standard Rotor (Model 2030R) Threshold: Approximately 10 cm/sec (1/5 knot). Range: Approximately 10 cm/sec (1/5 knot) to 7.9 meters/sec (15 knots). Response with Optional Rotor (Model 2030R6) Threshold: Approximately 6 cm/sec (3/25 knot). Range: Approximately 6 cm/sec (3/25 knot) to 100 cm/sec (approximately 2 knots).